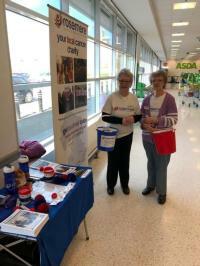 Thank you to all the staff and customers in Asda stores in Accrington, Burnley and Colne for having us in stores to collect during March and to our wonderful volunteers for their time and support helping to man the collection. You helped us raise a fantastic £551.12. Thank you to Rosemere supporters Joyce Greenwood and Hilda Makinson for hosting their second fundraiser for Rosemere and raising a wonderful £400! 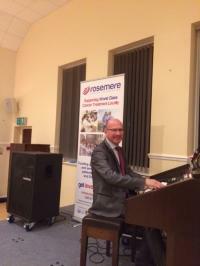 On the 9th March they invited Blackpool Tower organist John Bowdler to play “Music for Dancing” at West Bradford Village Hall. Thank you also to Joyce and Hilda's husbands, Sandy and Tony and to Rosemere supporters David and Janet Bristol for supporting Joyce and Hilda in their fundraising. 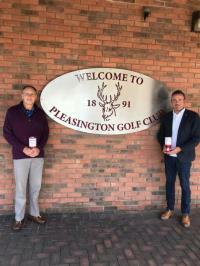 A huge thank you to all at Pleasington Golf Club for their fabulous year of support and to last year's Captains, Rob Allen and Nicky Robinson for choosing Rosemere as their Charity of the Year. Thanks too to Roger and Heather for supporting the Captains and organising a Charity Golf Day last September. The event was oversubscribed, the sun shone and in the evening Adam Catterall from talk SPORT and comedian Al Foran flew in from Dublin to provide the entertainment. It was a day to remember! Activities throughout the year have raised a staggering £11,663.41! 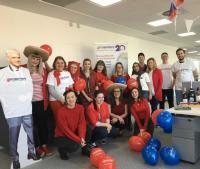 A huge thank you to all at Cummins Mellor Recruitment and CJUK for hosting a ‘Wear it Red for Rosemere’ day on Friday 22nd February. They hosted a fabulous day of fun activities raising a fantastic £335.78 in the process. A special thanks to Jodie and Stacie for organising the day. 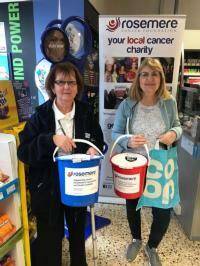 Thank you to all the staff and customers of Co-op Colne for having us in store to collect on Friday 8th March. You helped us raise a wonderful £127.09! Thank you to our volunteers who helped out for their time and support.